Summer Citrus Blond Ale #1 in fermenter. Just before yeast added. Didn’t look like we were going to be able to do a brew last weekend. But shuffled a few things around and did a brew on Saturday. Another Brew Smith kit, this time the Summer Citrus Blonde Ale. Was expecting another partial boil with grain, needing two pots. Not the case. This was a simple one with malt, hops and extras added straight into the wort. Two lots of malt, three hop additions, coriander seeds and lemon rind. Yeah, I was thinking the last two were a bit odd. But hey, it is a citrus blond. Did add in a bit more water than meant to at a couple of stages. For example washing out the malt bags to get all the powder out, and into the wort. For this one had to grate lemon rind in. We did it directly over the pot and used some boiled water to rinse the bits off the grater. Anyway, as a result we didn’t need to do any extra top up of water into the glass carboy fermenter. A side effect was that the wort was about 29 degrees Celsius. Plastic wrap went over the top of the carboy until the temperature could be dropped. The photo above was taken at this point. Extra cooling was done, but after another 20 minutes we could only get it down to 27 C. Not ideal, but needed to get the yeast in. 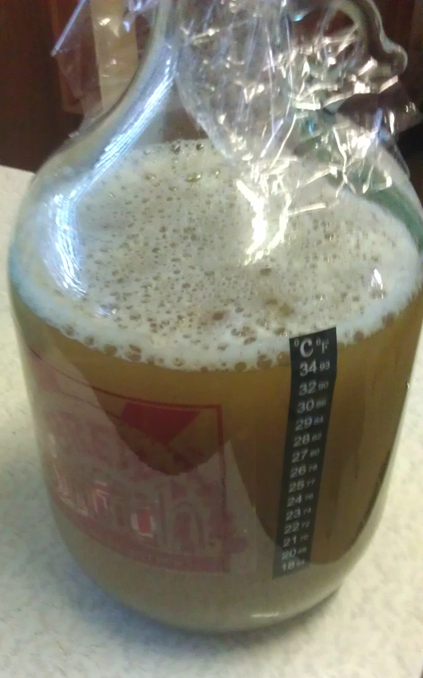 Airlock went on and stored away to brew. This is the second time we got a proper gravity reading on these small batches. Came out at 1.054 which is more or less in the range I was expecting. Means the beer will be around 5% to 5.5% alcohol, if all goes well. We’ve done a few of these Brew Smith kits now and this was the easiest by far. Bottling will be in about two weeks, just after good beer week (www.goodbeerweek.com.au). Then another two weeks in the bottle before tasting and review.